Less than four weeks prior to arrival: 100% of the total amount plus 50% of the subsistence costs. Up to 10% of the group members can be cancelled free of charge four weeks prior to arrival. 4-6 weeks after returning our group contract form, fully filled in and signed, the total amount for the reservation must be paid in advance. For bookings made on short notice up to one week before arrival, payment is possible only per credit card. Any remittance costs shall be charged to the depositor. Please note that upon arrival of the group we collect a security deposit of € 20.00 per person in cash. The teacher/group leader will collect the corresponding total amount and will have it available and hand it over to a member of the reception staff against receipt. Provided there are no complaints about the condition of the room upon check-out, the full amount of the deposit will, of course, be refunded to the teacher/group leader. The house rules are a component of the General Terms and Conditions. In the event of infringement of the house rules, Smart Stay City Hostel is entitled to terminate the accommodation agreement without notice. No refund is granted for services not taken advantage of due to contract cancellation. Anyone causing damage to the building or inventory is liable for the costs within the scope of the statutory provisions (in particular also escorts and event organizers). Theft and intentional damage of property will be promptly reported to the police. Upon the departure of groups the rooms will be inspected by our sta. Gross befoulment and damage will be invoiced and must be paid for upon check-out. Smart Stay assumes no liability for luggage stored in the luggage room or for vehicles or bicycles parked on the premises of Smart Stay Hostel Munich City. Our Smart Stay hostel is located right in the heart of the Munich's city center. We are within ten minute walk from the Central Station and all the major sights with shopping, bars, and restaurants around the corner. Stay at the only backpacker hostel that’s just two minutes’ walk from the Oktoberfest and near two subway stations taking you downtown to the Marienplatz! Explore Munich's heart, walk to all the city's major sites and find cafés, markets and nightlife just in our neighbourhood. Stroll up downtown, explore the English Garden and taste a beer at the Hofbrauhaus Brewery. Talk a trip to visit Schloss Nymphenburg or visit the German Museum located at the Isar River. Our staff will help finding your way around in Munich. We offer great value accommodation for everyone. 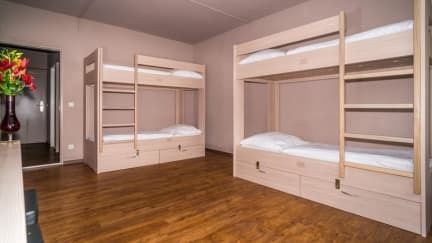 The size and variety of the rooms are unmatched - We offer private rooms, shared dorm rooms for 4, 6 and 8 people and female dorms , all with private bathrooms in every room and with lockers to secure your valuables. We offer spacious and cozy private, double, dormitory rooms (four, six and eightbed-rooms) all with private bathrooms. Each room has Free WiFi. You can also use our internet PCs in our internet cafe located just in the lobby. All accommodation is offered with ensuite facilities, dressing rooms and lockers. Bring your own lock! We also feature fast internet, a great kitchen, a lounge/TV rooms, laundry, luggage and bike storage and lots of local discounts. Great staff. The 8 beds bedroom was big enough to have our own space. The bathroom and toilet were clean overall. Everything good except Wi-Fi too weak to connect in dorms, and has been every year, needs upgrade. Also not enough power points in dorms, power boards would do the trick. Good staff, free luggage storage, clean rooms and bathrooms. Under bed lockers. Not close to anything. 2km from anywhere. Nice hostel. Clean rooms and perfect location. Highly recommended. There are no sockets near the bed. Good place to stay a couple of nights tops. The bathrooms and rooms were clean, and the staff was very nice. The kitchen was very small and there was always someone inside and stuff was not clean, they didn’t have mugs or glasses. The WiFi did not work in our room. The staff were lovely. Like many others, I will note that because the wifi is free (no passcode), it hardly works in the rooms. It does work downstairs but since it’s not a youth hostel, there are some... interesting figures. Ladies be careful please! There is no provided soap in the bathrooms, and no hand towel. The bed are comfortable. There is no privacy between the beds. I don’t think there are locks available anymore for storage, though I could be wrong about that. You get what you pay for. The hostel didn’t feel extremely secure as people who were not staying in the hostel could be found just outside the entrance or inside the common space using the wifi at all times of the day. Staff were pleasant however and it was nice to be right next to a u-bahn station. Good locatian, it's clean, but the staff is rude, agressive, they make their guests feel bad, I do not recommend it. It was not renovated for a long time, looks dirty. There are a lot of weird looking old man sitting in the lobby constantly. There were bedbugs on the bed, the carpet in the hallway was dirty, the walls were dirty, the kitchen was dirty. One had to wait around for more than 10 minutes to wait until the reception guy finished playing with his phone to get attended.